Aqaba, Mar. 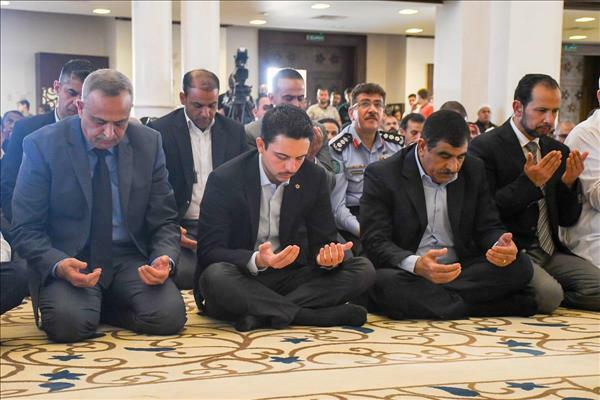 15 (Petra) -- His Royal Highness Crown Prince Al Hussein bin Abdullah II joined worshippers for Friday prayer at the Sheikh Zayed bin Sultan Al Nahyan Mosque in the southern Aqaba Governorate. The Crown Prince and the worshippers listened to the Friday sermon by Sheikh Abdullah Shahban, which focused on the importance of Jerusalem and Al Aqsa Mosque for Muslims and the need to defend them. Sheikh Shahban also spoke about the key role of the Hashemite Custodianship in safeguarding holy sites in Jerusalem.